After becoming interested in fountain pens I was adamant that I would use exciting and bold ink colours. I wanted inks that were interesting and fun, not what I'd assumed to be boring and unadventurous. Like most people in school I was restricted to write in blue and black ink, mainly in rollerball and ballpoint pens from a local stationery store. This mindset was later prolonged and carried over into my work environment. Therefore when the world of fountain pens and fountain pen ink opened up to me, the last thing I wanted was a blue or a black ink. It's said you shouldn't judge a book by its cover - although I still do this, and I feel the same warning should be applied to fountain pen ink. Don't judge an ink by its label. Or something far more poetic. I came across the brilliance of my favourite ink when it was brought as a gift for a family member. I was shocked at how beautiful it was and the depth of colour it achieved when I saw it first hand. Shortly afterwards I bought a bottle for myself. My favourite ink is the Pilot Iroshizuku Shin-Kai (or Deep Sea) blue-black ink. I currently have the Shin-Kai inked up in my Karas Kustoms Ink. My Karas Kustoms Ink has the Schmidt fine nib that gives me a slightly wider line than a Japanese fine nib and therefore allows me to admire the beautiful colour that Shin-Kai offers. I find Shin-Kai is perfect for any writing situation which increases its charm. Whether I am using this at work, for journalling or note taking, there isn't a time when Shin-Kai hasn't worked for me. The shading on the Shin-Kai is lovely. You get hints of light and dark blues remnicient of its deep sea name. There is a slight grey undertone that adds a nice variation on a traditional blue ink and perhaps is what has me hooked. With most other fountain pen inks I chop and change what I use becoming bored and sometimes distracted by new, shiny inks. But the Shin-Kai has consistently kept my attention and I really enjoy using it. The only downside on the Shin-Kai is that it is not waterproof, but this applies to all Iroshizuku inks. The odd spill of water or drop of rain will make this ink run. Don't use this on anything that could get wet. As with all other Iroshizuku inks the Shin-Kai flows well, is fairly wet and gives you a smooth writing experience. I would highly recommend this ink to any fountain pen user and think it is a great choice for people who are new to fountain pens. The moral of this blog post, don't judge an ink before you have seen it first hand. To caveat this post, this is my favourite ink as of today, right now in July 2015. I reserve the right to change my mind, at a whim if I please. I point this out as there are a lot of inks on my wish list and with the depth of choice out there in the market I am sure there is not only one perfect match for me. The Pilot Iroshizuku Ku-Jaku ink is truly lovely. This colour is subtle requiring close inspection in order to really appreciate what it has to offer. Onlookers may not notice too much of a difference in your ink colour if they don't pay attention, but when you look at the Ku-Jaku ink closely you really start to appreciate the tone and shading that it has to offer. For me Pilot Iroshizuku inks are great quality. The packaging has a premium feel with its simple and classic design. The colour of the ink is included on the box with a stripe down the centre. The wide, slim shape of the bottle shows off the ink colour and the thick glass bottom gives the bottle some weight. Before you even get to use the ink you get a sense of quality and pride from Pilot in what they do. I had been repeatedly looking at the Ku-Jaku colour online for months. I was interested in adding a green ink to my humble collection, but wanted something fairly dark with a bit of depth. I have pretty bad eye sight and sometimes a light toned ink colour leads to me strain my eyes so I tend to stay away from them. 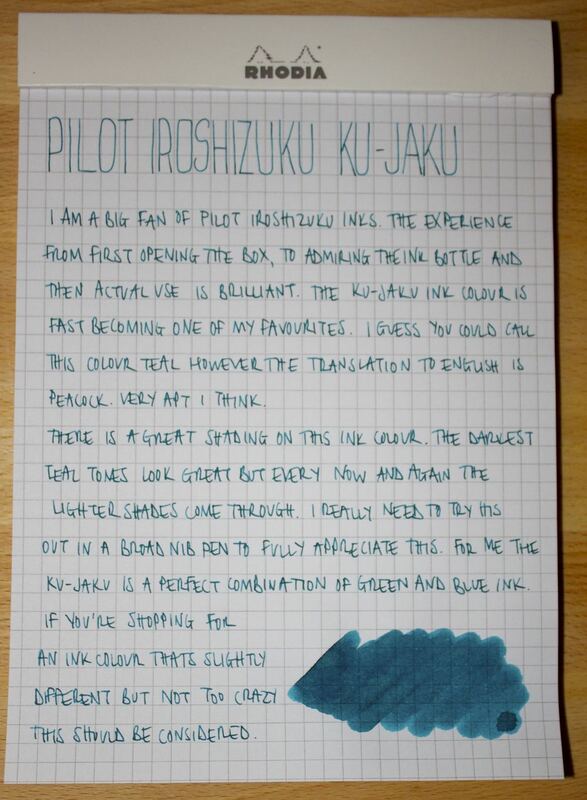 The Ku-Jaku is almost a mid way point between a green and blue ink and it is utterly lovely. The English translation of Ku-Jaku is Peacock which is the perfect image that this colour ink brings to mind. My written review below shows the great shading you get from the Ku-Jaku. The darkest shades are almost a rich teal colour and the lighter tones a great blue/green. At the moment I am not sure I have got the most from this colour as I have not used this in a broad nib pen, my review below was written with a Pilot Metropolitan with a fine nib. This is my second colour from the Iroshizuku range and I have found that the ink flows well no matter what brand fountain pen I am using. Dry times vary depending on the paper stock but on the whole the ink dries fairly quickly. I am really pleased that I decided to add the Ku-Jaku to my collection, it has fast become one of my favourite ink colours. It works really well for a winter ink tone and looks great in my notebooks. I would highly recommend it. You can pick up a 50ml bottle from most online retailers which should last you for a long time.